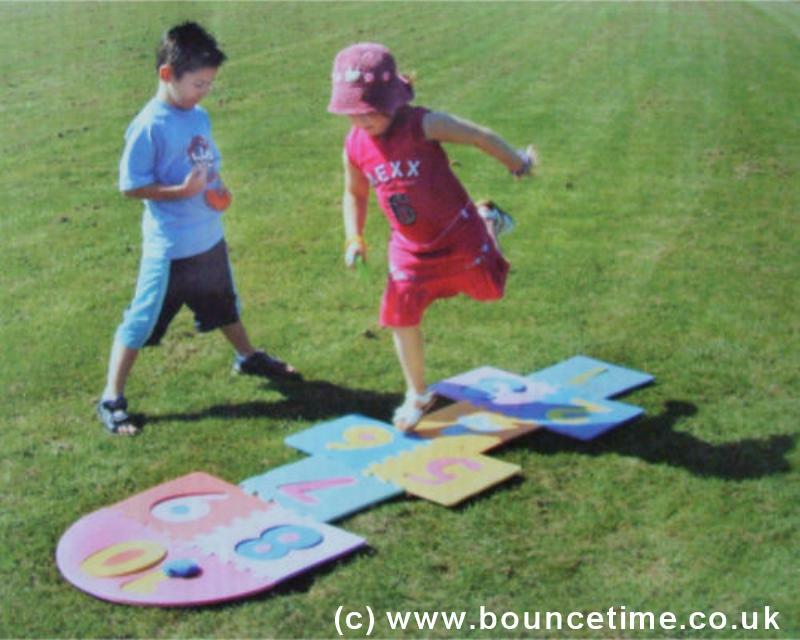 Hop Scotch Giant Garden Game - Bouncy Castle Hire 4 Kettering, Corby, Wellingborough, Rushden, Raunds, Rothwell, Desborough, Market Harborough, Adult Castle, Slide, sumo wrestling, Sumo, Crazy Games, Giant Garden Games, Northamptonshire. Our inflatables are ideal for kids parties, adult parties, Garden Party and a corporate or business event. Large and small events are catered for and we are fully insured. We offer cheap and discount prices in school holidays and for larger events. The players choose a coloured throwing marker and decide who is to go first. The first player has to throw their marker and get it to land on the slab marked 1. If they miss the play moves to the next player. If they are successful they have to move across the playing board missing the slab with there own stone on it.